There is perhaps no greater myth in Alberta politics than that the National Energy Program, which all Albertans are told to believe brought untold devastation to the oil sector and salted the earth for the federal Liberals in this province for decades to come. Looking beyond the myth, most Albertans might be surprised to learn that by the time the NEP was launched, it had already been twelve years since the (Pierre) Trudeau Liberals had last elected an MP in Alberta. 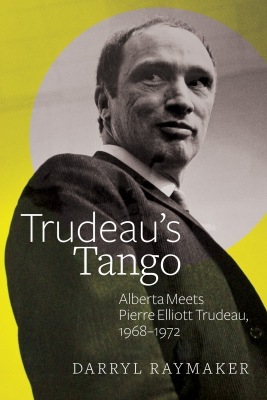 Long-time Calgary Liberal Darryl Raymaker does his share of myth-busting as he delves into a period of political optimism, generational changes and missed opportunities that swept through Alberta in the late 1960s and early 1970s in his new book, Trudeau’s Tango. 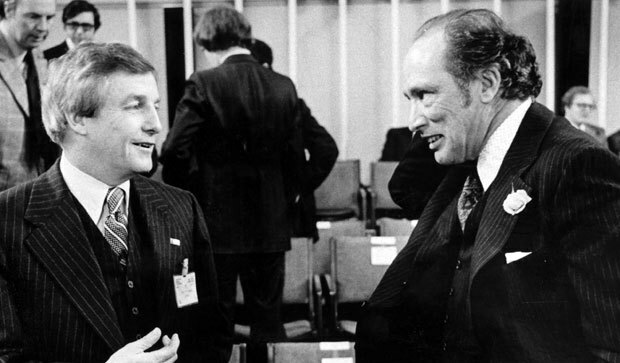 Alberta Meets Pierre Elliott Trudeau. An active member of the Liberal Party of Canada at the time, Raymaker’s book is rich with stories and anecdotes from the offices of party insiders and the trenches of the campaign trail during the Trudeaumania election of 1968. 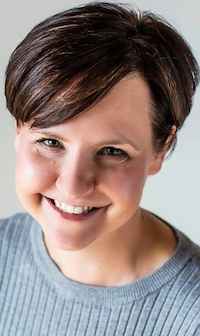 That election saw a federal Liberals breakthrough in Alberta, with four MPs elected, but a long-string of missteps and mistakes led to the party being shut out in the province four years later (and not electing another MP from Alberta until 1993). Raymaker provides useful insight into the fraught relationship between the four Alberta Liberal MPs and their Ottawa masters, between Trudeau and Calgary’s nouveau rich oil industry, as well as the federal party’s reaction to the shifting ground that led Peter Lougheed‘s Progressive Conservatives to unseat the long-governing Social Credit Party in 1971. One of the most fascinating stories Raymaker includes in his book is about the failed attempt to negotiate a political coalition between the federal Liberals and the provincial Social Credit Party. The political coalition was an attempt to solidify federal Liberal gains and keep Lougheed’s Tories at bay. The marriage negotiations failed, and as Raymaker argues, helped drive many traditional federal and provincial Liberals into Lougheed’s big-tent PC Party. The institutional memory that Raymaker shares in this book is invaluable to anyone wanting to understand the politics of a period that had a significant impact on Alberta’s politics in the following decades. While the context may be different, the book provides some parallels to today’s Alberta politics – the electoral breakthrough by the (Justin) Trudeau Liberals in 2015, Trudeau’s friendly relationship with the government of NDP Premier Rachel Notley, and the ongoing political battles over oil pipelines and climate change. 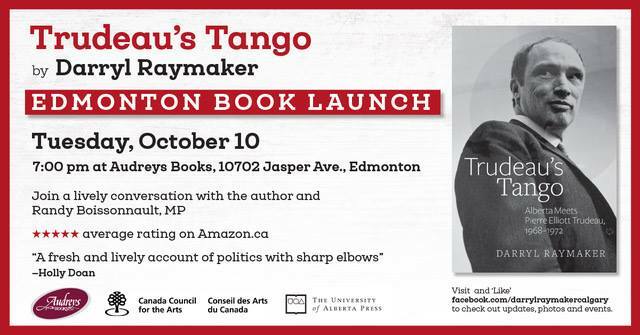 Darryl Raymaker will be launching Trudeau’s Tango in Edmonton on Tuesday, at a free event open to the public at Audreys Books on Jasper Avenue. Edmonton-Centre Liberal MP Randy Boissonnault will be sharing a few words at the event and facilitating a discussion after Raymaker’s talk. This entry was posted in Alberta Politics and tagged Darryl Raymaker, Liberal Party of Canada, National Energy Program, Peter Lougheed, Pierre Trudeau, Rachel Notley, Randy Boissonnault, Trudeau’s Tango. Alberta Meets Pierre Elliott Trudeau on October 10, 2017 by Dave Cournoyer. 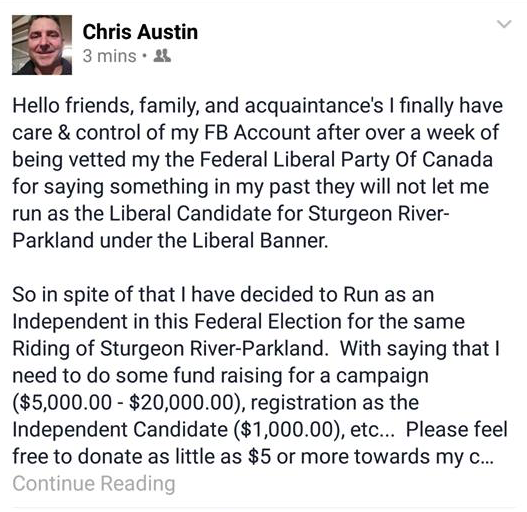 A Facebook post of disallowed Liberal candidate Chris Austin. 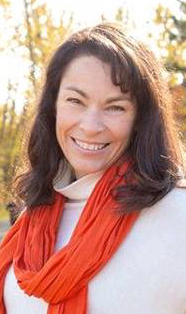 The federal Liberal Party appears to have cancelled the candidacy of Chris Austin, who was nominated as the party’s candidate in Sturgeon River-Parkland on September 7, 2015. According to a post on his Facebook page, Mr. Austin was disallowed because of something he has said in the past on social media. Mr. Austin said in the post that he plans to run as an Independent candidate in the riding instead. Mr. Austin ran as the Liberal candidate in the now-defunct Edmonton-Spruce Grove riding in the 2008 and 2011 federal elections, earning 11.5 percent and 9.3 percent of the vote in those races. 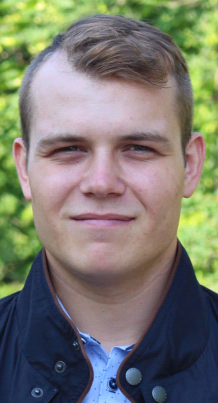 He was also the provincial Liberal candidate in the Spruce Grove-St. Albert constituency in the 2012 election. His departure brings the Liberals back down to 33 nominated candidates in Alberta. A new nomination meeting has been scheduled for September 17, 2015, where the Liberals are expected to acclaim candidate Travis Dueck. 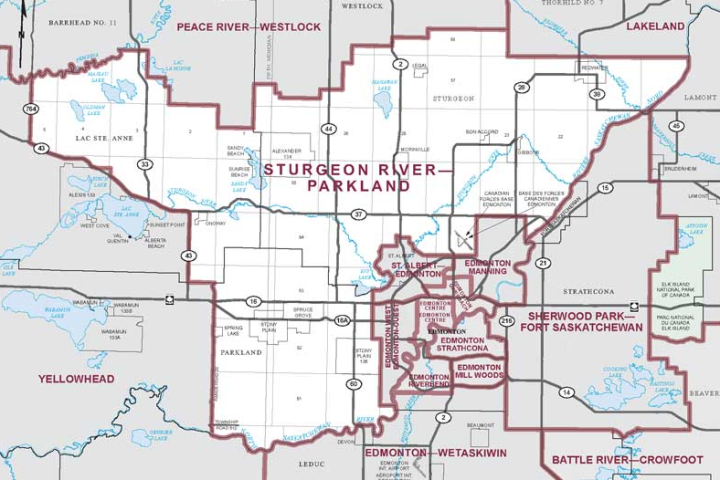 Other candidates running in Sturgeon River-Parkland include Conservative Rona Ambrose, Green Brendon Green, New Democrat Guy Desforges and Christian Heritage candidate Ernest Chauvet. 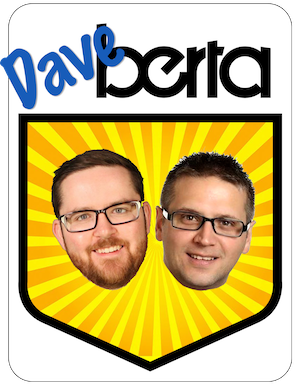 This entry was posted in Alberta Politics and tagged Brendon Greene, Chris Austin, Ernest Chauvet, Guy Desforges, Liberal Party of Canada, Rona Ambrose, Sturgeon River-Parkland, Travis Dueck on September 16, 2015 by Dave Cournoyer. Pundits from across the country are waxing and waning over comments made by rock n’ roll icon Neil Young about Canada’s oil sands. Mr. Young’s inarticulate criticisms of the oil sands (and comparing Fort McMurray to Hiroshima) have not helped the discussion around the impact of natural resource development in Canada, but he does deserve some credit for raising awareness about high cancer rates in the northern community of Fort Chipewyan. Oil is a dirty business. And when it spills it can make a big mess. But natural resources drive our economy and the jobs of most people living in Alberta depend on the natural resource sector, either directly or indirectly. How do we reconcile this? With plans for increased oil sands development and federal and provincial governments focused on promoting pipeline export, a federal by-election to be called within the next six months could increase national attention on the region. Fort McMurray-Athabasca Member of Parliament Brian Jean announced last week that he will resign from parliament on January 17. After ten years as MP for the region and as a quiet government backbencher in Ottawa, it is easy to understand why Mr. Jean decided it was time to move on. The departure is expected to draw a crowd for the Conservative Party candidate nomination. 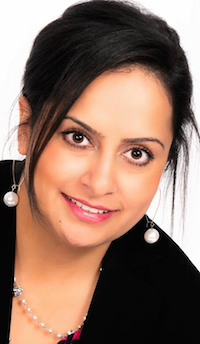 While the Tories have dominated in previous elections – winning 73% of the vote in the 2011 federal election – some local political watchers are expecting a strong fight from the Liberals. Could Justin Trudeau-mania put the Liberals in a position to make gains in northern Alberta’s energy capital? 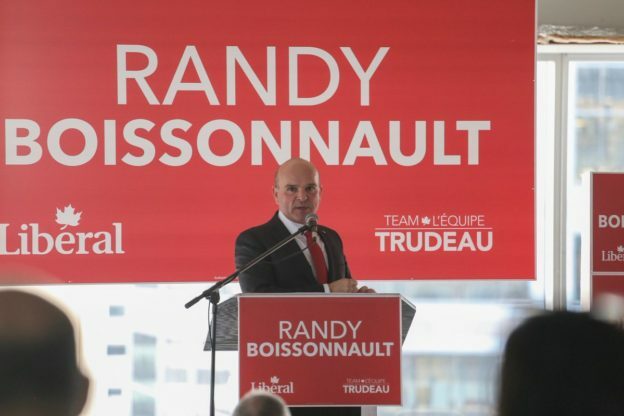 A prominent Fort McMurray Conservative announced last week that he was switching allegiances to the federal Liberal Party. 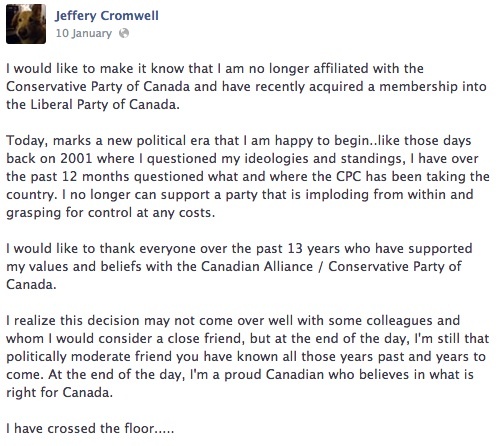 In a note on his Facebook page, Jeffery Cromwell, president of the Fort McMurray-Wood Buffalo Progressive Conservatives announced that he has left the Conservative Party of Canada and joined the Liberals. Until recently, Mr. Cromwell was a board member of the local federal Conservative electoral district association. A screenshot from Jeffery Cromwell’s Facebook page. This entry was posted in Alberta Politics and tagged Brian Jean, By-Election, Conservative Party of Canada, Fort Chipewyan, Fort McMurray, Fort McMurray-Athabasca, Fort McMurray-Wood Buffalo, Jeffery Cromwell, Justin Trudeau, Liberal Party of Canada, Neil Young, Oil Sands, Progressive Conservative Association of Alberta, Tar Sands on January 16, 2014 by Dave Cournoyer.